Finding the right Applicator for your product will make all the difference to the final finish and overall appearance of your job. We stock Roller Sleeves, which are suitable for use with all paint types to provide a smooth and pristine paint finish. 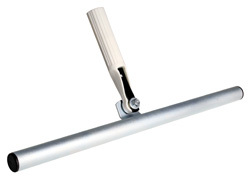 Roller Frames are perfect for heavy-duty painting and our range of high quality water based and synthetic Brushes provide a flawless application. Our Lambs wool Applicators are the perfect applicator for oils, stains and varnishes on internal floorboards or exterior decking.